Sorry for so many photos and sorry for the extended use of words "beauty" and "beautiful"! It's been more than a week since I'm back from this trip, and I finally stole some time from myself to publish a new post. Living in Finland as an exchange or master's student is obviously great for another reason: organized trips for students! We booked Saint Petersburg while we were still in Germany and it was such a funny and great thing: it would have been only ten days that we're studying in Joensuu, and then we go to Russia for fun! Saint Petersburg is, in a word, indescribable. I was swept away by its beauty. It has only happened to me once: when I was in high school, there was a fight amongst students whether we should go to Prague in our final year or Italy. I voted for Italy with all my heart, whereas I didn't know anything about Prague and didn't have the slightest wish to visit it. Somehow Prague won. Later on I was so happy that it did, because otherwise I wouldn't have come up with the idea of visiting it. Well, of course I would have when I was wiser and older :), but that was what I had thought at the age of 18. I think the main reason for me not wanting to go to Prague back then was ignorance. It was similar this time - in the meantime I started loving travelling so much that I would go anywhere I haven't been before - but I knew nothing of Saint Petersburg and didn't have any expectations. Well, this city is the most beautiful one I saw this year. Okay, I do have some doubts regarding Berlin, but let's put it this way: I wasn't thrilled by Berlin. I think I could only compare SPB to London. N.B. This is only a personal impression, because I think London is the most beautiful place I have ever been to and I am completely in love with it. Something similar happened to me in SPB. Pure beauty!!! Oh, and as for the title: when I started blogging a month ago, my wonderful friend Tamara, who is into artsy photography, told me my photos were fine, but "please make sure you have no wires hanging around". Well! I can't wait she sees this post. 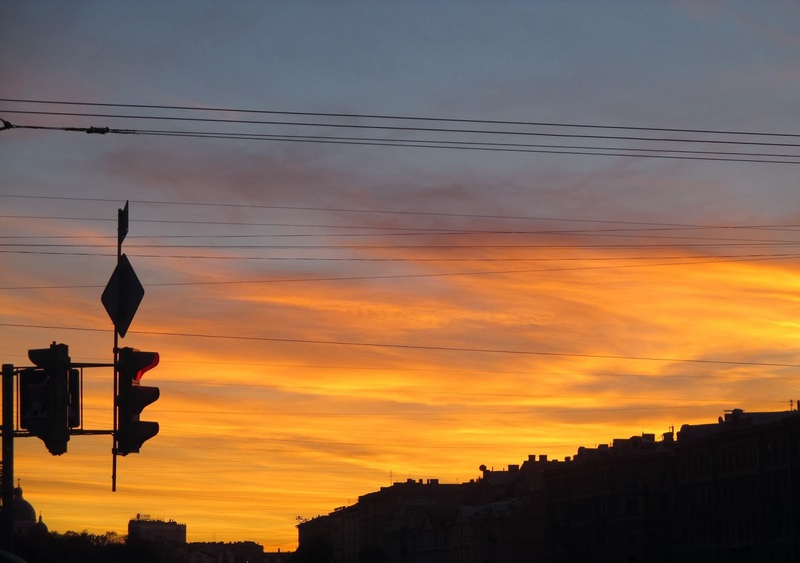 :) Saint Petersburg is ALL about wires. Electricity wires, tram wires, trolleybus wires. I find the wires kinda charming in the photos, though. What do you think? First thing we did in SPB was a bus tour. I wasn't really pleased, because I couldn't take proper photos! And I fell in love with the city instantly, but it felt like a really short-term long-distance relationship, as we didn't even have time to admire parts of the city we were shown because hey, we're going somewhere else! Apart from that the tour was good and really informative, I loved our tour guides. So if you see a reflection in some photos, it's because they were taken from the bus - sorry! Luckily enough, we stayed in a hotel that is pretty much in the center (Dostoevsky Hotel, if you plan to visit SPB I would definitely recommend this one because it's nice and the location is perfect - even though Wi-fi could get weak if there are too many people) so we could wander around later on and see all the main sights. Saint Petersburg is located on the Neva river and has numerous canals and bridges - so many that some call it the Northern Venice. It was the capital of Russia from its founding in the beginning of the 18th century up to 1918. Nowadays it's the second largest city in Russia, and referred to as the cultural capital. I wonder what Moscow is like - I would love to visit it someday soon and I'm really curious: will it make me fall in love as much as SPB did? Funny spelling of "Steak House"
If you're a hipster, you know where to go! I love these photos! We were standing on a bridge and on our left the sky was pink, while on our right it was orange. Such a wonderful sunset!